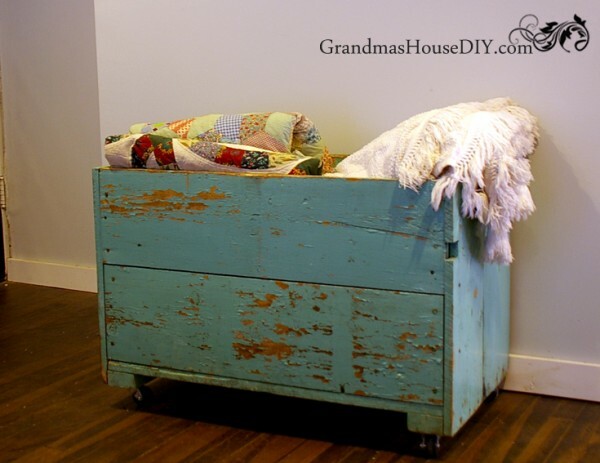 My Grandma's old carrot bin becomes my living room blanket box! 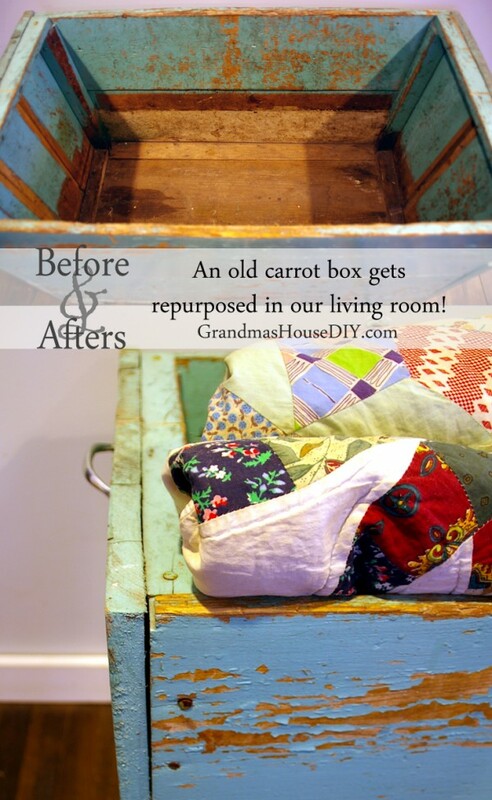 My Grandma’s old carrot bin becomes my living room blanket box! This old storage box goes back a really long way. This is one of those house objects that’s been here so long that I may as well just assume that it has no age at this point. I’m thinking it may have even been here when my Grandparents moved in back in the fifties. It sat in the basement in all of its aqua glory, filled halfway with sand and then, every single fall, completely stuffed full with carrots to keep all winter long. It would also keep potatoes and it stayed in the room with all of my grandma’s mason jars and every other kind of food that can be grown this far north in Minnesota and then stored every winter. 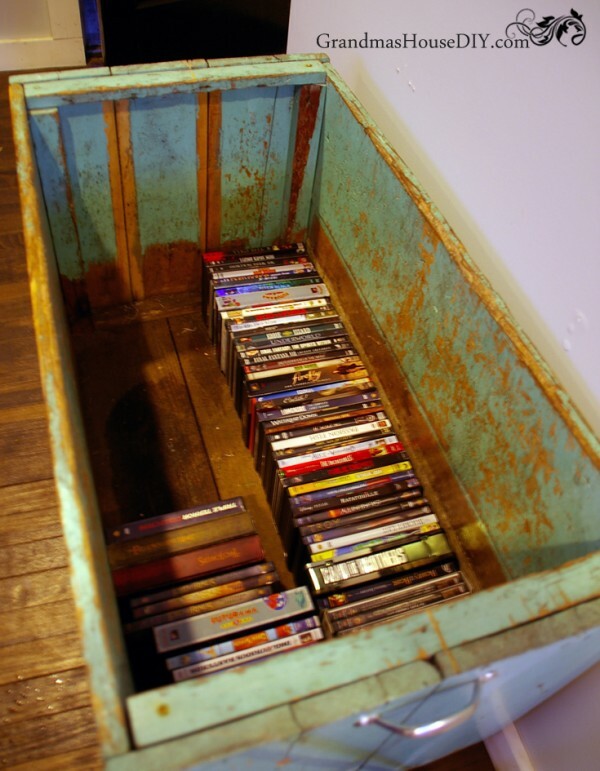 It was a great, big, sturdy, storage box that I immediately fell in love with years ago and had not forgotten it when I started on the house renovation. 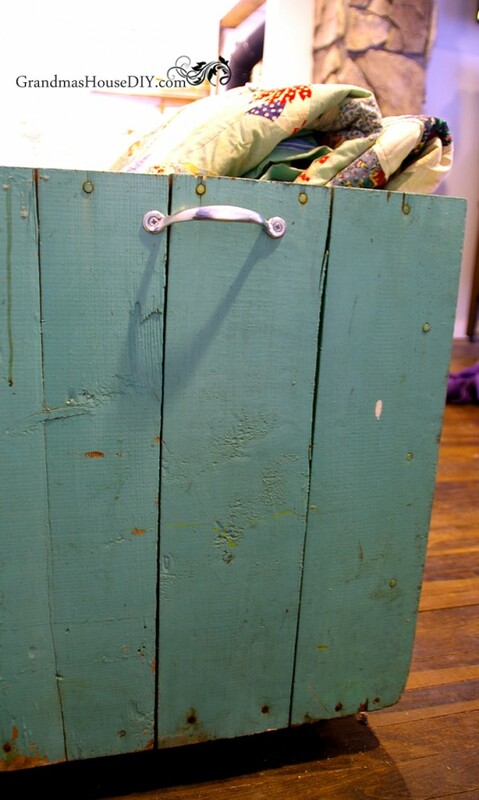 I slapped some big sturdy casters on it, a couple of handles and used it as my tool storage box for several months. 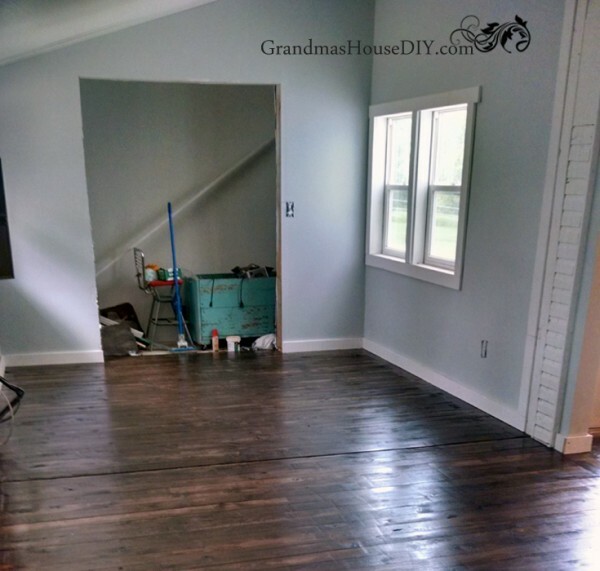 You might remember seeing it here in my second ever post of all time: How to: install an inexpensive wood floor that looks like a million dollars. It was kinda sad back then, I never liked using it as my tool chest, I kept holding my breath expecting it to get destroyed or something. But, low and behold, it survived the house renovation! I dug it out a couple of weeks ago, emptied it completely of the last of the tools and got to cleaning it out of decades worth of dirt. Then, I covered the entire storage box with poly acrylic (inside and out) and then brought it back in the house. I always knew where it would go and what its job would be and, I think my grandma’s old storage box is quite happy with its new cushy job in its retirement: Holding my DVDs and all of my living room blankets and the quilts my Grandma made years old. I love how shabby chic it is without my having to do anything to it! 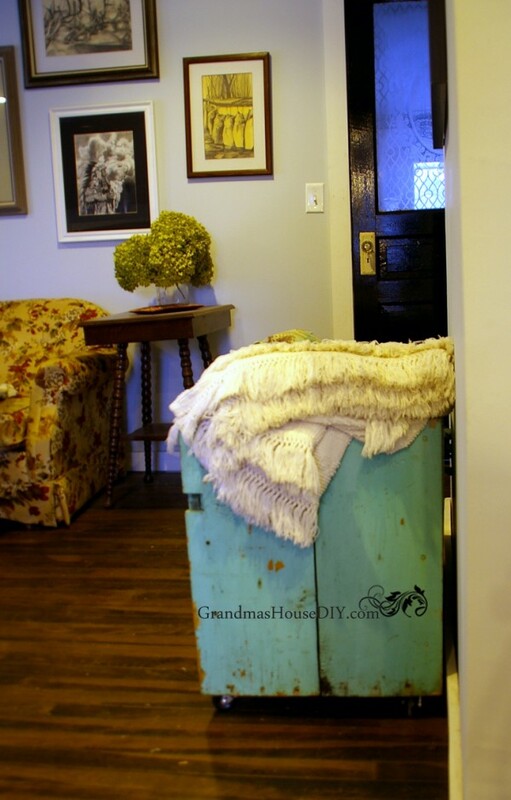 Because its on big castors its not going to ruin my floors and its really easy to move around! All in I’m ecstatic about the amount of storage it offers and I love how it makes me think of Grandma every time I look at it! Its the same color as she had chosen to paint her kitchen, a color I ran into many times during my house renovation. I love that I got to keep the color as well as added some incredible function to my living room. 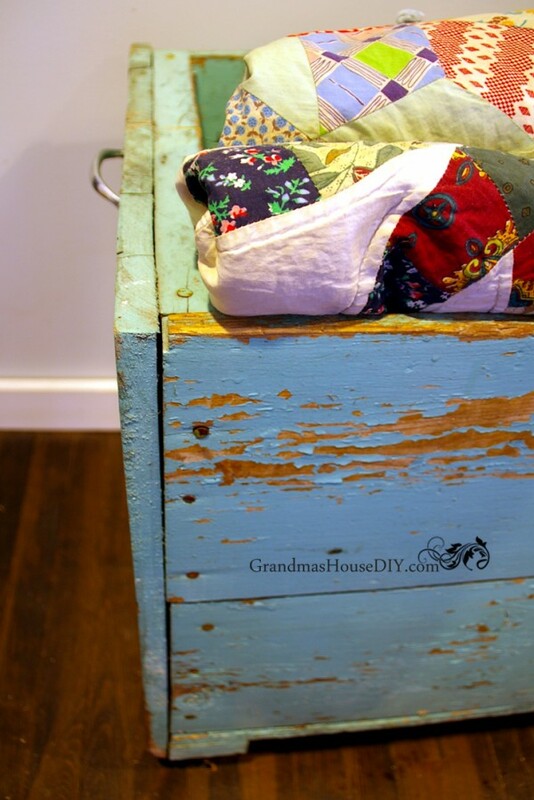 I’ve always played with the idea of adding an upholstered cover to the top of my storage box so it can double as seating. Oh I know exactly what you mean! I get the same soft and fuzzys when I read about other bloggers doing the same thing. 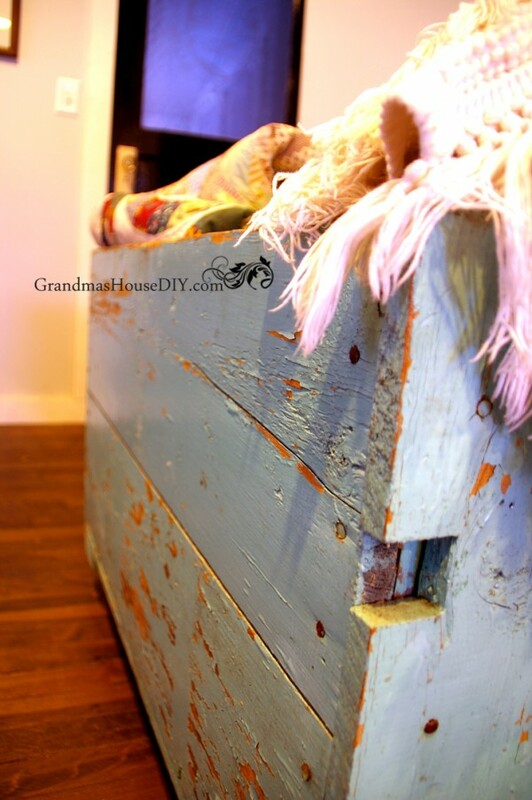 I love it that so many people now are starting to reach back and are saving the furniture and things from their grandparents!